1952. UFO squadrons over Washington, D.C. Tracked on radar. Visual sightings by military. Verdict: "Unexplainable." 1976. UFO dogfight with F-4 Phantom II jets over Tehran. Weapons "jammed." Radar/visual confirmation. Verdict: "Unavailable: Top Secret." 1981. UFO lands in Trans-en-Provence. Investigated by French police. Soil samples analyzed. Verdict: "UFO. No hoax." Compiled here are the most compelling and authenticated UFO cases ever recorded. Fresh from the government's secret files, spanning over a half century of eyewitness testimony, documented sightings, and unexplained phenomena, this groundbreaking compilation presents the chilling evidence that UFOs are real--and that a government cover-up has long suppressed the stunning truth. 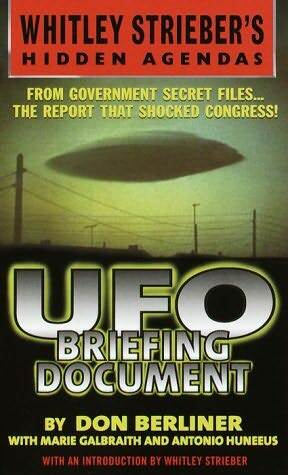 Complete with excerpts from official transcripts, diagrams, and photos, UFO Briefing Document, funded by Laurance Rockefeller and presented to Congress, contains critical information the public has a right to know....now, before it is too late.